Three tiny satellites are pioneering the innovative, inexpensive use of off-the-shelf cell phone technology to control space missions just days after launching aboard the test flight of the Orbital Sciences Antares rocket. The trio of PhoneSat spacecraft, each small enough to hold in one hand, switched on after deploying from the Antares rocket Sunday. With the automatic activation of the satellites' smartphone brains, the PhoneSat mission raced ahead of a similar British smartphone-based satellite named STRaND 1. The UK-built spacecraft launched in February and initially operated with a conventional CubeSat computer before it was supposed to be switched over to an on-board Android-based Nexus One phone. But STRaND 1 stopped communicating with Earth a few weeks ago, before engineers at Surrey Satellite Technology Ltd., the builder of the spacecraft, were able to turn on the smartphone control system. The PhoneSat mission will not last long - perhaps only a week or two - but the PhoneSats could usher in a wave of low-cost satellites to serve applications as varied as remote sensing, heliophysics research and commercial communications. The PhoneSats were built for about $3,500 each by engineers at NASA's Ames Research Center in Moffett Field, Calif. The builders installed smartphones into the standardized CubeSat spacecraft in place of conventional computers. The satellites, nicknamed Alexander, Graham and Bell after the inventor of the telephone, are cube-shaped and measure about 4 inches on each side. They weighed about 2.5 pounds each at the time of launch. Smartphones have flown in space before inside the International Space Station, and the computer from a PDA launched inside two Japanese CubeSats in 2006 and 2008. But the PhoneSats and STRaND 1 take the concept a step further. Two of the PhoneSats carry Nexus One smartphones made by HTC Corp. Another satellite, dubbed PhoneSat 2.0, is controlled by a more advanced Nexus S phone made by Samsung with a faster processor and solar panels. All three PhoneSats run on Google's Android operating system. 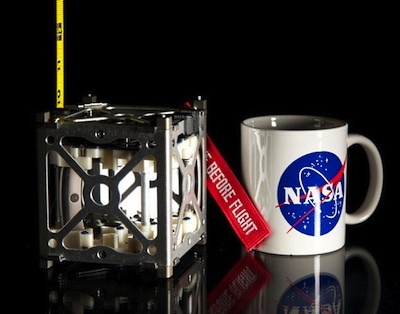 "In two of the three [satellites], it's the actual cell phone in its case," said Andrew Petro, the executive for NASA's small spacecraft technology program. "It's actually the way you buy it off the shelf. The only thing they did is they took the cover off the battery, removed the original battery, and wired in a bunch of external batteries to give it a longer lifetime." Engineers took a different approach with the 2.0 version and removed the cell phone components from its case to save weight for the satellite's solar arrays, Petro said. The two PhoneSat 1.0 satellites should operate for about a week, while the 2.0 version will recharge its lithium-ion batteries with solar power and could function until the CubeSats re-enter the atmosphere within two-to-four weeks after launch. "The PhoneSats only have one operating system, and that's their standard Android OS as shipped out of the box from the phone vendor," said Jim Cockrell, PhoneSat project manager at the Ames Research Center. Cockrell said the software controlling the satellites run as Android applications, and engineers added a radio for one-way communications to downlink data to Earth. "This is a test of the hardware to see how it goes and show that you can take a phone off the shelf, put it in a box with a limited amount of modification, and fly it as a satellite," Petro said. The satellites are programmed to take pictures of Earth using the phones' built-in cameras. The images are coming back to Earth in data packets, which must be processed to retrieve the photos. "As far as we know, PhoneSats are the first ever satellites controlled entirely by a smartphone," Cockrell said in an email to Spaceflight Now. The UK's STRaND 1 satellite was still running off its computer when officials lost contact with it. 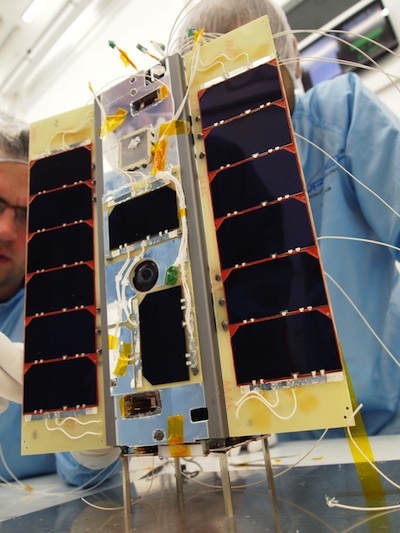 "We lost contact with STRaND 1 a couple of weeks ago, but the causes are unclear since we have also had ground station issues from the start," said Joelle Sykes, a spokesperson with SSTL, the satellite's UK-based manufacturer. Sykes said Tuesday the STRaND 1 team is working with amateur radio operators to search for signals from the satellite. "There are lots of variables to check out, so this could take a couple of weeks," Sykes told Spaceflight Now. "We haven't switched to the phone yet. That was next on the agenda when we lost contact." As of Thursday, Surrey engineers had not announced any resumption of communications with STRaND 1. STRaND 1 is larger than NASA's PhoneSats, and its mission promised to demonstrate more ambitious objectives than the U.S.-built satellites. Unlike the PhoneSats, STRaND 1 was loaded with software for two-way communications, magnetic field measurements, and a "Scream in Space" app to broadcast screams submitted by the public through the phone's speakers, testing the theory "in space no one can hear you scream," made popular in the 1979 film "Alien."